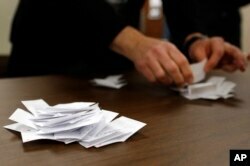 FILE - Slips of paper and pencils to be used by voters to select their candidates sit on a table before a Republican party caucus in Nevada, Iowa, Feb. 1, 2016. 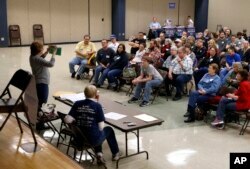 FILE - Voters listen to instructions during a Democratic party caucus in Nevada, Iowa, Feb. 1, 2016. FILE - Precinct chair John Anderson counts votes for Republican candidates during a caucus in Nevada, Iowa, Monday, Feb. 1, 2016. 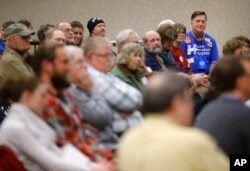 FILE - John Grause, top right, precinct captain for Democratic presidential candidate Hillary Clinton, sits with voters during a Democratic party caucus in Nevada, Iowa, Feb. 1, 2016.